Adventure Game Studio | Forums | Oceanspirit Dennis's Holiday Havoc! 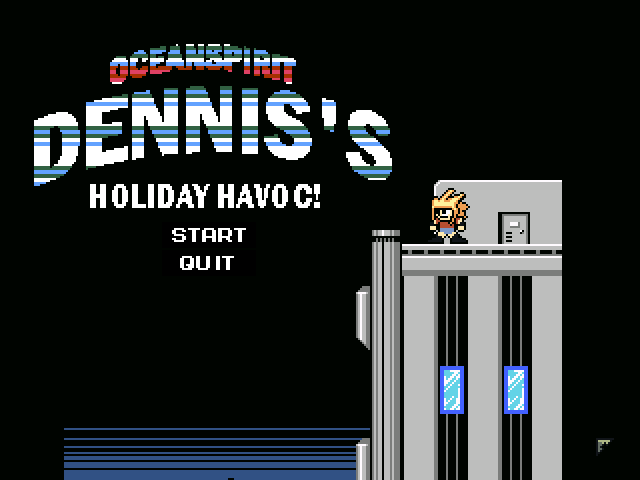 Topic: Oceanspirit Dennis's Holiday Havoc! Finally, after sitting on this game for the better part of 2 years, the lovely CalinLeafshade helped me figure out the code that was needed to get this thing together, and after roughly 14 hours of coding and drawing, I now give you all the "gift" of my foray into the world of Oceanspirit Dennis. Re: Oceanspirit Dennis's Holiday Havoc! Downloaded (my desktop if full of Oceanspiritdennisness now!) and started. Hilarious! Now to figure out how to beat them all! beatedst it. Funs it wasts! Oh noes! Why do I have to be stuck at work on today of all days! Curse my gainful employment!! Congrats on finally finishing this game, which will surely be your legacy for years to come. EDIT: Finished! Very fun little game. Brought back many pleasant memories of my early Nintendo days.